October 11, 2016, 9:30 am & 2:30 pm. Please join Lama Mark and members of the Dharma Centre Community in celebrating the memory of the Ven. 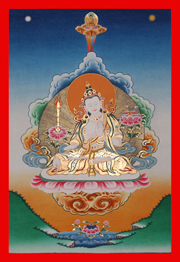 Dorje Namgyal Rinpoche through the bestowal of the White Manjusri wongkur and instructions on its glorious practice. White Manjusri is a peaceful manifestation of full Awakening. As a meditational deity he reveals pristine wisdom and boundless compassion for all life. This meditation practice is renown for purifying ignorance, negative karma, sharpening one’s intelligence and increasing our wisdom, compassion and merit. This empowerment will give permission to practice the meditation of White Manjusri. Lama Mark Webber will give a reading transmission and instruction from the sadhana composed by the Terton, Lho Jedrung Nuden Dorje. Please join us all for a Tsok after the empowerment and a pot luck meal at the mail house. When: Tuesday, October 11. The empowerment will be offered at 9:30 am, followed by a Tsok (spiritual feast). Pot luck lunch served in the main house. A sadhana reading and teaching will take place at 2:30 pm. Please bring a food to share at the tsok. Potluck Lunch: Everyone is welcome to stay for lunch at the Centre. Please bring a salad to share. There is a fee of $25 for participating in the empowerment and teachings for those coming up for the day. This fee will go towards support Lama Mark’s travels and teachings. Dana for Lama Mark Webber: Teachers give the teachings of awakening (Dharma) freely so that anyone, no matter their financial means can attend classes. 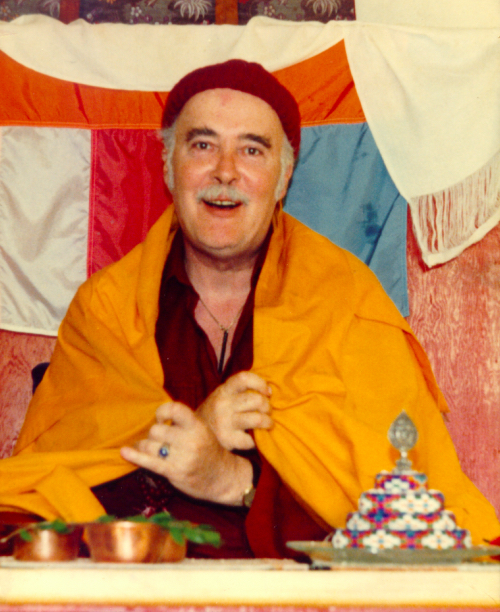 Each time one receives teachings, it is an opportunity to consciously practice generosity. Giving money and other means of support expresses gratitude and support to the teacher and helps to ensure that these teachings continue. Each person receiving Dharma teachings determines the kind and amount of Dāna according to one’s heart and one’s financial means. When deciding how much to offer, one should think about what these teachings mean to you and try to give accordingly. It is recommended that students make an offering of dāna at the beginning of a class or retreat to establish the intention to make the most of this opportunity for one’s own progression and for the benefit of all others. Please register with the Dharma Centre of Canada to be part of this auspicious day at info@dharmacentre.org or phone toll-free at 1.866.266.0966.